Actually, my blog’s byline wasn’t the brainchild of days of brainstorming. Actually, not even hours. It came in a spur of the moment. I just started with “The Chronicles of” and then what came into my mind right away was “the lion, the witch and the wardrobe.” So I just modified it to fit what my blog would be all about: my being a mom, a wife, and a teacher. But then I agree with my friend that I have to live up the last portion of the byline. In the afternoon, I also went to an appointment in the same wardrobe. For the past days, this I guess is the only get-up I kinda like. 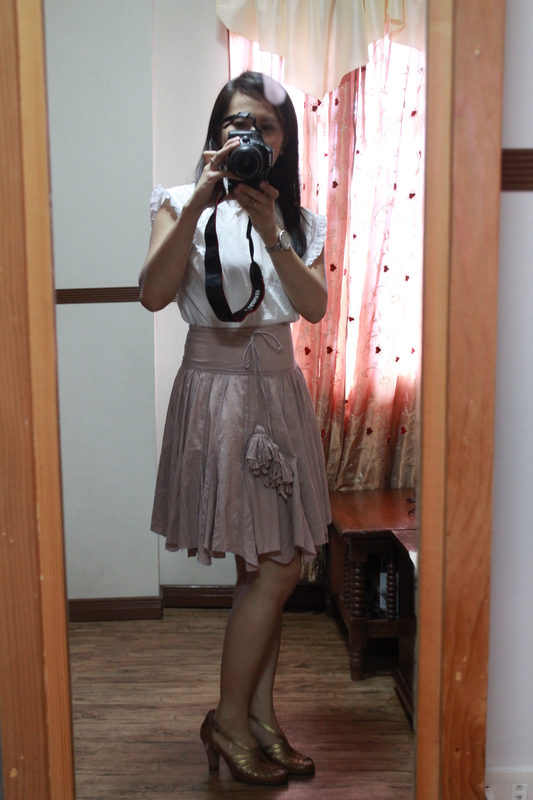 You see, this mala-Blair Waldorf outfit hides the fact that I’ve gained a LOT of weight. Huhuhu. I no longer enjoy my other outfits because I’m afraid I’ll look awful in them! I try them on and think I look good but then I realize that I might just be blinded–that I’m not seeing clearly! I ask Randy and he tells me I look good, but what does he know?!? He ACTUALLY likes me chubby (minus the love handles) and rejoiced when he saw that my thighs are sooo back to being (this must be read with a deep, booming voice, ‘yung parang nananakot): THUUUUNDER THIIIIGHS! Pang of guilt: I remember not being able to resist eating P70 worth of deep fried, oily proven yesterday pa! Shame on you Dewmaine! Shame, shame, shame! Eureka! Now I realize that keeping a wardrobe diary (that the whole world could see) might actually help me lose weight. I, of course, will want to showcase my outfits on MY SLIM BODY, and NOT my current fatso body. It’s been more than a year thus I can’t blame my love handles on Raviv. Besides, four months after I gave birth I’ve already become slim. So absolutely NO EXCUSES! dew! i am surprised talaga that you wear ukay clothes.